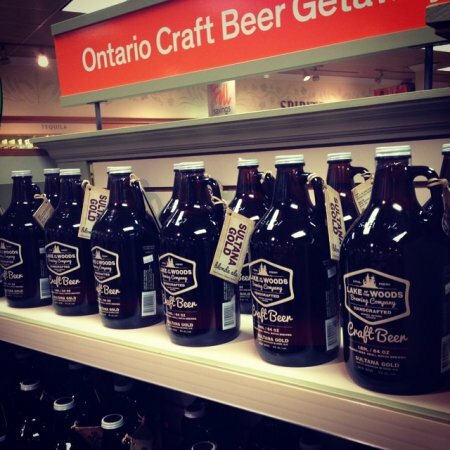 KENORA, ON – Lake of the Woods Brewing has announced the launch of off-site growler sales at liquor stores in Ontario and Manitoba, with the Ontario sales being an unexpected development in the province’s beer retailing system. The appearance of 1.89 litre jugs of LOTW’s Sultana Gold Blonde Ale on LCBO shelves in Kenora and Keewatin was announced last week on the brewery’s Instagram feed, and marks the first time a modern craft brewery has offered the format at the province’s government-run liquor retailer. As owner Taras Manzie tells Ontario beer news website Mom & Hops, the heat-sealed and fully LCBO compliant containers will also soon be found at locations in Fort Frances, Sioux Narrows, Dryden and Sioux Lookout – all stores that LOTW can deliver to frequently to ensure the stock remains fresh. Thanks to Kenora’s proximity to the border with Manitoba, similarly fresh stock can be offered in that province as well, and as announced on Facebook, eight Liquor Mart locations and eight hotel stores in Winnipeg are also selling growlers of Sultana Gold. For more details, see the LOTW Brewing Facebook page.